There are numerous available radiative transfer models, yet these packages typically require complex installation and compilation procedures for them to operate, and they are particularly restrictive in operational scope (e.g., planet, type of atmosphere/surface) and wavelength (e.g., spectral database, file formats). For instance at the internet encyclopedia (Wikipedia), there is an entry for "Atmospheric radiative transfer codes", listing dozens of packages and their capabilities (wavelength range, geometry, scattering, polarization, accessibility/licensing, etc.). There have been several attempts to quantify the differences between different packages (e.g., Alvarado et al. 2013), and a commercial internet facility (www.spectralcalc.com) implements a small subset relevant to Earth/Mars science. With this online tool, we pursue to provide to the community an accurate and comprehensive (UV/Vis/IR/mm) planetary tool, allowing to synthesize realistic spectra for a broad range of objects (rocky planets, gas giants, icy bodies, TNOs, comets, exoplanets, etc. ), and assisting with the planning and execution of current and future NASA missions. 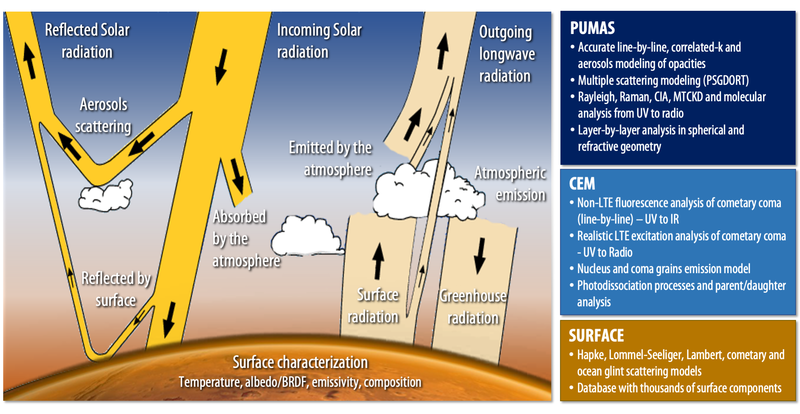 This is achieved by integrating two core radiative-transfer models: the accurate and versatile PUMAS atmospheric/scattering model, and the cometary emission model (CEM). Components of the PSG radiative transfer: the diagram shows the different components considered by the radiative transfer modules. By performing a layer-by-layer analysis, PUMAS intrinsically integrates and calculates the different flux contributions across the wavelength grid. For comets, the molecular calculation is performed separately by CEM from the surface fluxes, and later added to compute integrated fluxes. Planetary and Universal Model of Atmospheric Scattering PUMAS integrates the latest radiative-transfer methods and spectroscopic parameterizations, in order to compute high resolution spectra via line-by-line calculations, and utilizes the efficient correlated-k method at moderate resolutions. The scattering analysis is based on a Martian scattering model (Smith et al. 2009), while the line-by-line calculations have been validated and benchmarked with the accurate GENLN2 model (Edwards 1992). Villanueva, G. L. et al., Science, Volume 348, Issue 6231, pp. 218-221 (2015). Smith, M. D. et al., JGR, Vol. 114, E00D03, (2009). Edwards, D. P., "GENLN2: A general line-by-line atmospheric transmittance and radiance model, Version 3.0 description and users guide", NCAR/TN-367-STR, National Center for Atmospheric Research, Boulder, Co. (1992). Simulations that encompass the whole observable disk would require sub-sampling in order to properly capture the diversity in incidence and emission angles. Specifically, when the FOV is much smaller than the object disk (e.g., nadir, limb, occultation and looking-up observations), a single set of geometry parameters is typically sufficient when performing the radiative transfer calculation. The issue is when the FOV samples a broad range of illuminations and surface properties (e.g., the FOV is comparable and/or bigger than the object disk); in this case, one would need to compute radiative transfer simulations over different geometries, which would be then integrated to produce a single total planetary flux. By default, PSG currently defines one set of geometry parameters and one radiative-transfer calculation per simulation, yet we integrated into PSG an algorithm that allows to sub-sample the observable disk into sub-sections of similar incidence / emission angles. The algorithm takes as input N, or the disk sub-sampling parameter (entered in the target section), which defines the number of angle bins for the incidence and emission angles. Since these angles range from 0 to 90, a N=5 would lead to a sub-division with bins of 18° and leading to 22 distinct radiative-transfer regions as described in the figure below. The computational requirement scales quadractic with N, so a conscious choice has to be made between accuracy and performance. The default is N=1, leading to typical errors less than 5% in flux, while N=3 reaches typical errors lower than 1%, and N=10 reaches flux accuracy better than 0.1%. Disk sampling methodology: when the beam samples a broad range of incidence and emission angles, PSG allows to divide the observable disk into sub-sections of similar incidence / emission angles. The sampling parameter (N, disk sub-sampling) defines the number of angle bins for the incidence and emission angles. Typically, N=3 reaches errors lower than 1%, and N=10 reaches a flux accuracy better than 0.1%. The surface defines one of the "boundary" conditions of the radiative-transfer analysis. For expanding atmospheres, these parameters relate to those of the nucleus and to the dust particles. Currently, PSG describes the surfaces as Lambertian (with the corresponding albedo) and emitting as a black-body (with the corresponding emissivity). We have developed a versatile surface module that combines a realistic Hapke scattering model (Protopapa et al. 2017) and the capability to ingest a broad range of optical constants, permitting PSG to accurately compute surface reflectances and emissitivities. The surface model considers areal mixing and a one-term Henyey-Greenstein phase funtion. In this section, the user defines the desired characteristics of the synthetic spectra (wavelength range, resolution, desired radiance flux, noise performance, etc.). When observing with ground-based observatories, PSG allows to affect the synthetic spectra by telluric absorption. The tool has access to a database of telluric transmittances pre-computed for 5 altitudes and 4 columns of water for each case (20 cases in total). The tool can also perform noise (and signal-to-noise ratio) calculation by providing details about the detector and the telescope performance. PSG allows to define several type of telescope/instrument modes, while in all cases, the integration of the fluxes is done over bounded and finite field-of-views and spectral ranges, with no convolutions applied to the fields. Single telescope: this mode is the classical observatory / instrument optical setup, in which the etendue is defined by the effective collecting area of the main mirror ATele and its corresponding solid angle Ω.
Interferometer: this mode is characterized by an etendue that is proportional to the number of antennas (e.g., ALMA), in which ATele = nTele⋅π⋅[DTele/2]2. Coronagraph: the model for the coronagraph is relatively simple, and it is mainly intended for identifying regimes of operation. This mode assumes that the throughput is minimum (1/contrast) within half the inner-working-angle (IWA), it reaches 50% at the IWA, and the throughput is maximum (100%) at 1.5 times the IWA. 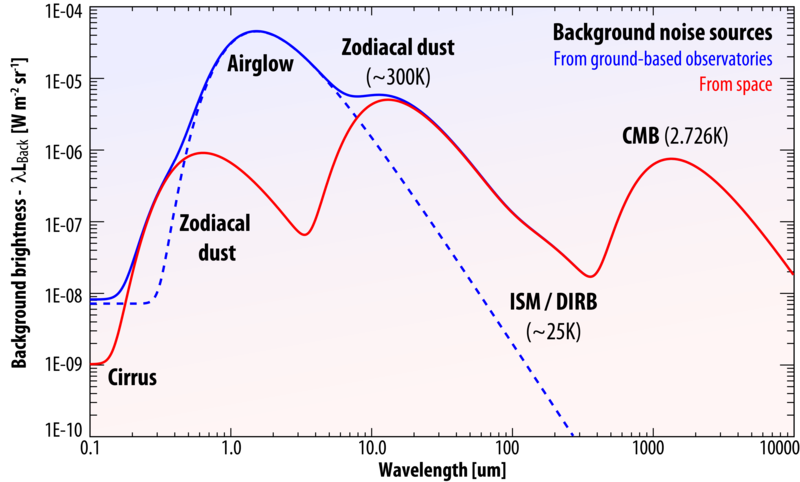 Relevant to this mode is also the "Exozodi" level, which indicates the level of zodiacal dust in the exoplanetary system w.r.t to Earth's zodiacal fluxes. AOTF+grating: this mode characterizes telescope/instruments in which an Acousto-Optical-Tunable-Filter (AOTF) is located between the entrance optics and the spectroscopic grating (e.g., ExoMars/TGO). The AOTF can be described with 6-parameters (only the center is required): center [cm-1], width [cm-1], sidelobes factor, base, gauss width [cm-1], factor. The grating is described with 2 parameters: center [cm-1, required] and width [cm-1]. LIDAR system: in this mode, the "laser" source is injected in the FOV as an additional radiation flux, with the beam [FWHM] describing the laser divergence of the source, and DTele the diameter of the receiver. Two parameters describe the laser intensity, its peak power [W] and the duty cycle [%] (ON/ON+OFF). The integration time is considered to be for the complete spectral scan, so an integration time of 1 sec for 100 spectral points, would correspond to an integration time of 10 ms per spectral point. The standard case assumes that the receiver is colocated with the laser-source for nadir/observatory geometries (with the surface behaving as a Lambertian), while for limb geometries, PSG assumes that the receiver is located at the other side of the occultation. When entering a second value in the duty-cycle field, one defines that the receiver/source are also colocated for limb geometries, with this additional value defining the reflectivity of the reflector at the other side of the occultation. We have compiled a database of instrument models for a diverse range of telescope/instrument combinations, assisting the user when defining the basic parameters of the instrument. Additional instrument models are being developed. 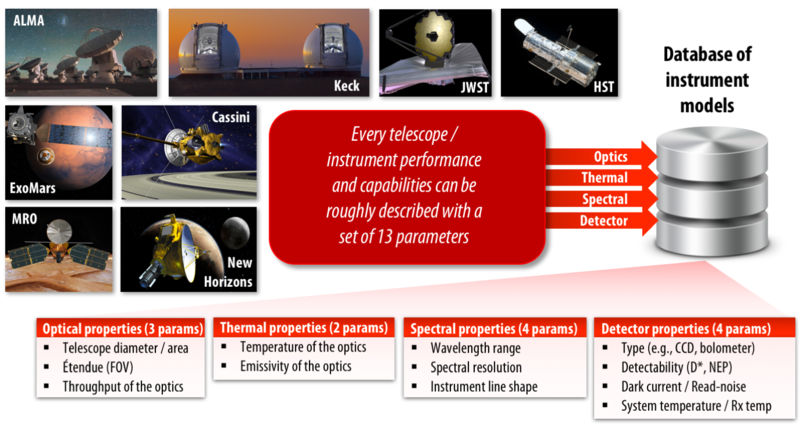 Instrument model: We have identified 14 key parametes that are sufficient to describe the overall capabilities and performance of a particular telescope/instrument combination, and we are now in the process of compiling a database of instrument models, that will assist the user when defining the basic parameters of the instrument. We have developed an echelle simulator for iSHELL (Immersion Grating Echelle Spectrograph) at the NASA Infrared Telescope Facility (IRTF). It employs a set of ab-initio grating equations and simplified parameters that are accurate enough to describe the overall behavior of the cross-dispersors and the gratings. PSG allows to compute synthetic fluxes in a broad range of possible units. The constants used for the conversion are: λ is the wavelength in microns (μm), c is the speed of light (299792458 m/s), ASR is arcseconds2 per steradian (4.2545166E+10), h is Planck's constant (6.6260693E-34 W s2), k is Boltzmann's constant (1.380658E-23 J/K), ATele is the total collecting area of the observatory (m2, nTele⋅π⋅[DTele/2]2), Ω is the field-of-view of the observations (steradian). When observing with ground-based observatories, PSG allows to affect the synthetic spectra (or simply show) by telluric absorption. The tool has access to a database of telluric transmittances pre-computed for 5 altitudes and 4 columns of water for each case (20 cases in total). The altitudes include that of Mauna-Kea/Hawaii (4200 m), Paranal/Chile (2600 m), SOFIA (14,000 m) and balloon observatories (35,000 m), while the water vapor column was established by scaling the tropical water profile by a factor of 0.1, 0.3 and 0.7 and 1. Opacities at 225 GHz, a typical metric to quantify water at radio wavelengths, can be estimated from the reported water column as τ225PSG = 0.0642 x PWV, where PWV is the ammount of water in precipitable millimeters. PSG currently includes a noise calculator for quantum and thermal detectors, with the primary goal of providing users with quick look simulations for planning observations, and to assist with the development of new instrument/telescope concepts. The user can provide a constant value across all wavelengths (RMS), or a constant value with background noise (BKG), or can choose from several detector noise simulators. At short wavelengths (e.g., optical or near IR), the background photon counts follow a Poisson distribution, and the fluctuations are given by √N where N is the mean number of photons received (see review in Zmuidzinas et al. 2003). This Poisson distribution holds only in the case that the mean photon mode occupation number is small, n<<1. For a thermal background, the occupation number is given by the Bose-Einstein formula, nth(v,T) = [exp(hv/kT)-1]-1, so the opposite classical limit n>>1 is the usual situation at longer wavelengths for which hv<<kT. When n>>1, the photons do not arrive independently according to a Poisson process but instead are strongly bunched, and the fluctuations are of order N, instead of √N. This is why the Dicke equation is used to calculate sensitivities for the receiver temperature mode (TRX), which states that the noise is proportional to the background power rather than its square root. The formalism employed for the TRX module is based on the ALMA sensitivity calculator (Yatagai et al. 2011). PSG assumes that the instrument has a defined spatial resolution (beam [FWHM]), defined by the user for the center wavelength. This spatial resolution will change across wavelength (proportional to λ), and therefore the solid-angle (Ω) will be proportional to λ2. 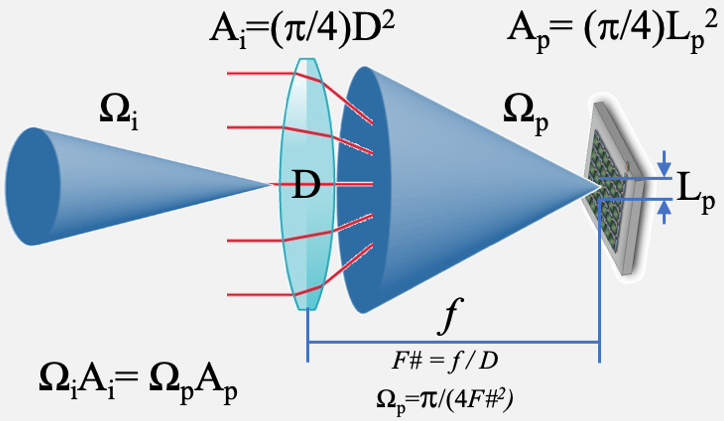 Since Ω is changing with wavelength, and the instrument has a fixed spatial resolution (defined by the optical design and detector properites), the number of pixels encompassing Ω will be also proportional to λ2. npixels: total number of pixels for Ω and dλ. Ω [steradian]: is the solid angle of the observations. It is wavelength dependent. Background noise sources: When observing faint astronomical sources, the sensitivity is affected by the shot noise introduced by background and diffuse sources (Leiner et al. 1998, A&A, v.127, p.1-99). From space, the background is dominated by the faint and diffuse emission (thermal and scattered sunlight) from zodiacal dust, while airglow (a mixture of photoionization emissions, chemiluminescence and scattered sunlight) dominates the background for ground-based observations. Zodiacal dust fluxes depend greatly on the ecliptic longitude/latitude - in PSG, the noise simulator considers a scaling of 2 with respect to the minimum ecliptic pole values. PSG also employs a rudimentary (as shown), yet relatively effective, approximation for atmospheric airglow.